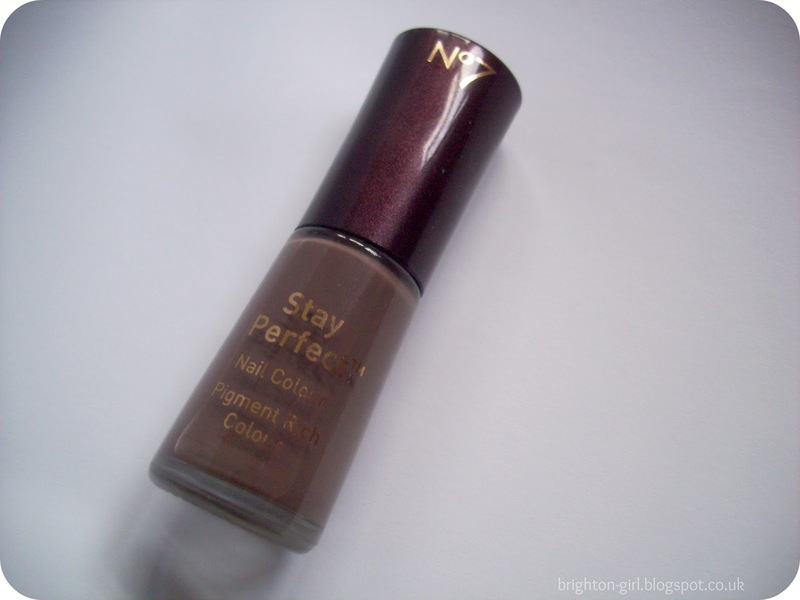 This No7 Stay Perfect Nail Colour has been rolling around at the back of my drawer since last year as it's not really a colour I wear during the Summer. It is, however, the perfect shade for Autumn, so I rescued it from behind my other polishes! Named 'Beanie', the polish is a rich, deep grey-ish brown. It's similar to Barry M's 'Mushroom', but perhaps a tad darker. I like a really glossy finish to my nails. In the photo below I'm not wearing a top-coat and you can see that 'Beanie' gives an excellent shine. The first coat is a little patchy, but full opaque coverage is achieved in two coats. The application is really improved by the brush, which is slightly longer than your average and has a nice rounded shape. I've seen that No7 have since altered the bottles of their nail polishes; I really hope they've kept the design of the brush! Despite the high-shine finish, you do need a good topcoat as I've found it can chip easily if it's worn without one. Overall, though, I really like this polish. I'm glad I rescued it from the back of drawer and am now wondering what other treasures I've forgotten about. I'm definitely going to have a rummage this week to see what else I can find! Have you rediscovered any Autumn beauty must-haves recently? I really like No 7 polishes but I would've never picked a colour like this! It actually looks really different on, so nice. Ah I've been looking for a color like that, it's so pretty! Lovely blog, and I really like the colour!